In typical OnePlus fashion, the company has been slowly teasing different aspects of the upcoming smartphone before its official announcement, which is set for June 20. Meanwhile, an earlier leak points to a June 22 release date for Amazon India. Today we get an idea of what the OnePlus 5 could cost in Finland and/or most of Europe. 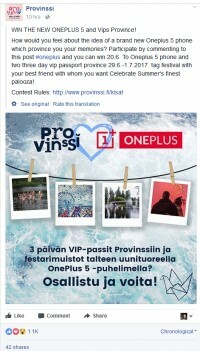 A post made on the OnePlus forums points to a contest for an annual music festival taking place in Finland. The grand prize is a OnePlus 5 device and two three-day VIP passes to the event. The contest was posted on Facebook this morning. But wait, the official rules of this contest reveal more. Usually, when a company posts a contest of this kind, they are required to include the value of the prizes for various purposes. The total value listed for the prize is €948. Assuming the aforementioned prize of a OnePlus 5 and two VIP tickets to the festival is the total amount of this prize, and each VIP ticket is €199, algebra says the remaining value is €550. This is the supposed retail value of the OnePlus 5. This means that the OnePlus 5 could be more expensive than the 3T, which currently carries a price tag of €439 on OnePlus’ Finnish site. The OnePlus 3T is also listed in the US with a price of $439. Which could also mean the OnePlus 5 is soaring well past USD 500. The OnePlus 5 will feature the latest Snapdragon 835 CPU from Qualcomm and will feature either 6GB or 8GB of RAM. A dual-camera setup is also expected, and gathering from the teased camera sample, this should be an excellent camera for low-light photography. If the OnePlus 5 is $/€ 110 more than the OnePlus 3T, will you still buy one? Thanks for sending this in, Henning! They almost always overestimate their prize values in those contests. So the price of the phone is more likely to be 500Â€ or under.